The GSM team welcomes technical challenges. Our expertise has evolved precisely because we have taken on challenges that exceeded our capabilities. For instance, when designers for the recycling containers in Chicago’s Millenium Park turned to us after two major Chicago fabricators failed to satisfy the design specifications, the GSM team developed a new technique for consistently rolling the perfect ellipse required. That new capability now serves other customers who manufacture blowers and lawn mowers. When another customer, a military supplier, had an emergency request, we broke the rules of aluminum welding to respond, resulting in development of a process that was both reliable and 4 times as fast as conventional methods. Our customers say the biggest advantage they see in doing business with us is the way we collaborate to solve their problems while never losing site of their production deadlines or compromising our quality. Our knowledgeable use of machine and information technology allows us to connect every part of our organization to bring customers the results and value they need to protect their brand and successfully compete–every time, on time. As with most businesses today, technology is a critical factor in our success. But technology alone won’t solve problems. Whether solving a manufacturability problem, suggesting ways to take the cost out of your product, or securing your supply chain as you scale production, it takes creativity and know-how to apply those technologies cost-effectively. Most of the products that we manufacture utilize customer provided designs. 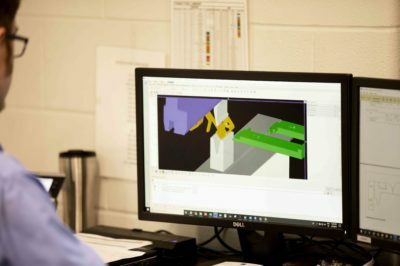 Our systems provide us the capability to “virtually manufacture” a customer’s part or assembly before ever reaching our manufacturing floor, allowing us to provide accurate estimates and production rates while quickly transitioning to production parts within hours. Our customers value our efforts to help them control future costs to eliminate risk in their supply chain. Through knowledgable use of industry forecasts, internal and customer projections, and our financial strength, we mitigate the impact of raw material price fluctuations through negotiation of long-term pricing agreements with our suppliers. Wherever feasible GSM will secure contract pricing in order to fix raw materials cost for the duration of the production period.